Once you register for your account, booking an appointment with a writing tutor or librarian is quick and easy. select "Writing Centre" from the drop-down list of schedules. book one appointment, or several -- it's up to you! Can't find an appointment that works for you? You have other options! Come to the Learner Centre on the 2nd floor of the Singhmar Centre for Learning (Downtown campus) for drop-in help with a writing tutor or a librarian. Contact us at writing.centre@norquest.ca. We'll try to find a time that works for your schedule. How to book an appointment (once you've registered your account). Are you a regional, online, distance, orevening student who can't meet in person? We will meet you online! Once you book an appointment you will receive additional information on how to log in to your session through an online program called Bridgit. the marking guide or rubric - how is your instructor marking you? Please note: it is not possible to work on all aspects of the writing process - from developing a thesis to discussing grammar - in one session. We recommend you come when you start your assignment and book several appointments! A session is 30 minutes long. Together, we'll take a look at one or two aspects of the writing process. What would you like to learn more about? Having trouble finding articles for your research? We can teach you research strategies that will help you to narrow down your topic and find the information you need to get started. Having trouble getting your ideas down on paper? We can show you how to develop a strong thesis and how to organize an effective paper. Have you completed your writing assignment and want to edit it for grammar? We can show you how to review and edit your paper on your own. We can also help you to review your graded assignments so that you avoid repeating the same mistakes on your next assignment! Tell you "what you should write"
You have options! You can come to the Learner Centre on 2nd floor of the Singhmar Centre for Learning (downtown Edmonton campus) for drop-in help at the Library or Tutorial & Academic Coaching Services. If the drop-in options don't work, please email us at writing.centre@norquest.ca, and we will do our best to accommodate you. Have you already had an appointment with the Writing Centre? Tell us what you think by filling in this very brief and anonymous feedback form. Thank you! 1. Only book appointments you know you will use. While coming to the Writing Centre regularly is a good way to develop your writing skills, don't book several appointments at once "just in case" you need them. Booking only appointments you know you will use means that everyone has a chance to get the help they need. 2. Don't book back-to-back appointments. 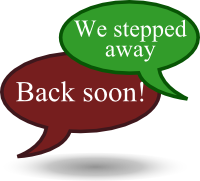 If you book back-to-back appointments, we will automatically cancel your second appointment. In other words, if you have appointments at 10:00 and 10:30, we will cancel your 10:30 appointment. You will still be able to come for your 10:00 appointment. 3. Cancel your appointment at least 24 hours in advance if you can't come. If you can't come to your appointment, try to cancel at least 24 hours beforehand. Cancelling a day in advance lets other students take advantage of a newly-opened appointment slot. If something comes up at the last minute, that's OK. We would rather you cancel at the last minute than not at all, but please try to cancel as soon as you know you can't come. If you are more than 10 minutes late for your appointment, we will cancel it. We will still be happy to help you through the drop-in services at the Tutorial Centre and Library. Restrict or remove access to service for the remainder of the semester if a student fails to adhere to the College’s Student Code of Conduct by engaging in disrespectful behavior towards librarians and tutors or other students during appointments.